Wireless quadcopters have become a popular toy for tech enthusiasts, with the most prominent example being the Parrot AR Drone, a mobile phone powered helicopter that comes fully assembled. But many tech hobbyists have been using the power of the Arduino platform to create quadcopter projects of their own. An Arduino quadcopter is not a project for beginners; it combines a large amount of sensory and user input, and a fairly sophisticated coordination of outputs in order to provide the quadcopter with stability and keep it aloft. Fortunately, there are a number of open source projects that provide an accessible introduction to this world. If you are ready for a more challenging Arduino project, check out these open-source quadcopters. AeroQuad is one of the oldest and most active communities for open-source quadcopter development. If you are brand new to this field, it is a great place to start learning about the undertaking, regardless of whether you ultimately use the AeroQuad format. The detailed breakdown of hardware outlined on the AeroQuad site gives a glimpse into the complexity of this project. In addition to the Arduino, the AeroQuad requires a triple axis accelerometer and gyro, a pressure sensor, a rangefinder and a magnetometer as well as a shield to allow connection of a number of sensors to the Arduino. 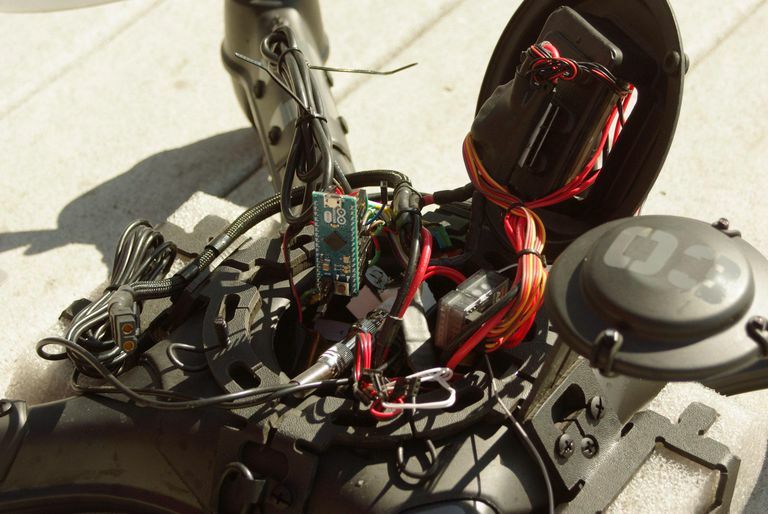 There are many other components required for the AeroQuad, but suffice to say this is not a project for beginners. The Arducopter is another popular open source copter project and makes provisions for both quadrotor and hexarotor form factors. This project has less information on the hardware aspects of building a quadcopter and assumes either a pre-assembled copter or the purchase of a pre-made quadcopter kit. The focus of this project is on the software. The Arducopter software works in conjunction with the APM2 Arduino autopilot module, and allows for sophisticated control of an Arduino copter, with GPS based waypoints and flight planning. The Scout UAV is another Arduino based project, and is smaller in the community than AeroQuad, but also provides a detailed breakdown of an Arduino quadcopter build from a hardware perspective. This project is based on the ArduPilot Mega 2.5 system, which combines many of the required sensors and telemetry systems for copter flight on one board that is compatible with the Arduino. The APM2.5 module is the revised version of the module used by the Arducopter project, and is very robust, having been tested in the Outback Challenge UAV contest. The quaduino-ng is a small Arduino quadcopter project with a unique mission compared to many of its counterpart projects. The goal of quaduino-ng is to build a low-cost quadcopter, but this cost may add up. The build description and software appears to be less robust than some of the more popular projects above, so implementation of the quaduino project may require more know-how and improvisation than one of the better supported projects. However, with the right expertise, the quaduino-ng project may save you some significant money. Last but certainly not least is one of the most robust communities for Arduino based flight, DIY drones. This project provides a great deal of expertise, being the creator of the ArduPilot Mega, the all-in-one autopilot module that serves as the basis for many of the Arduino quadcopter projects above. The DIY Drones site is focused on support and community around the APM module and includes instructions for using the component in not just copter based vehicles, but in plane and rover based vehicles as well.